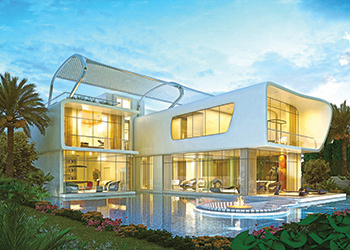 Bugatti-styled villas ... planned for Akoya Oxygen in Dubai. The world’s first Bugatti-styled villas are set to come up in Dubai, UAE, within the lush green, 55-million-sq-ft Akoya Oxygen master development, overlooking the Tiger Woods-designed Trump World Golf Club, Dubai. Launched by luxury real estate developer Damac Properties at the Cityscape Global exhibition in the UAE emirate last month, the exclusive limited edition collection called Ettore 971 Bugatti-styled villas are named after Ettore Bugatti, the founder of the renowned French luxury super sports car brand Bugatti with ‘971’ signifying the international code for the UAE. The seven-bedroom villas are conceptualised by the designers of the world’s fastest street-legal production car, the iconic 1,200 hp Bugatti Veyron and stylishly reflect its distinctive curved front. Prices will be in the region of Dh36 million ($9.8 million), reflecting the high-end styling and finishing in each unit. The design also includes an indoor vehicle display area, with glass panels through to the living quarters, so owners can admire their car from the comfort of their sofa. “The Ettore 971 Bugatti-styled villas at Akoya Oxygen are the true expression of ultimate luxury living,” says Ziad El Chaar, managing director, Damac Properties. The indoor vehicle display area ... within view from the living quarters. 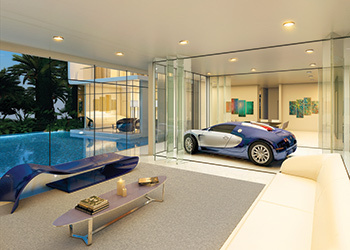 “We are delighted to be working with Damac Properties on these unique living concepts, which reflect the key design codes of the Bugatti brand,” says Massimiliano Ferrari, managing director of Bugatti Brand Lifestyle. At Cityscape, Damac also unveiled an exclusive four-tower project Viridis at Akoya Oxygen. Two of the towers will comprise 370 hotel apartments, which will be managed to five-star standards by Damac Properties’ hospitality brand, NAIA. Each unit will be fully serviced, including a fitted kitchen and can be placed in the company’s rental pool programme. The other two towers will include 356 private, residential units which will look out over the golf course and the entire project. All of the units have access to a high-tech gymnasium, swimming pool and lounge area, as well as retail and restaurants on the ground floors. Damac said the four 13-storey towers are the first high-rise units to go on sale in the 55-million-sq-ft master development. Damac Properties has cemented its place as a leading luxury developer in the region, offering iconic design and the upmost quality. The company’s footprint now extends across the Middle East with projects in the UAE, Qatar, Saudi Arabia, Jordan and Lebanon. As of June 2015, it has delivered 14,375 homes and has a development portfolio of more than 37,000 units at various stages of progress and planning. Included are more than 10,000 hotel rooms and serviced hotel apartments under development, which will be managed by its hospitality arm, Damac Hotels & Resorts.